National Anthem hymn or song expressing patriotic sentiment and either governmentally authorized as an official national hymn or holding that position in popular feeling. 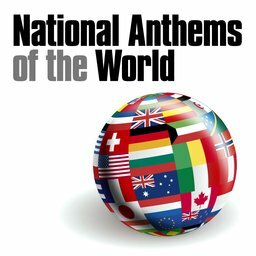 During the 19th and early 20th centuries, most European countries followed Britain's example, some national anthems being written especially for the purpose, others being adapted from existing tunes. The sentiments of national anthems vary, from prayers for the monarch to allusions to nationally important battles or uprisings. Word definition ANTHEMATOLOGY/ANTHEMATOLOGIST - the study and collection of information about anthems - the word was invented by David Kendall in Canada in 2003. 'God Save The King' was played non-stop 16 or 17 times by a German military band on the platform of Rathenau railway station, Brandenburg, Germany on the morning of February 9 1909. The reason was that King Edward VII was struggling inside the train with the uniform of a German Field-Marshall before he could emerge! The music blared at a soccer match in Athens between a Chinese and a Greek side, and the crowd rose and stood in respectful silence. They assumed it was the Chinese National Anthem. The Chinese players also stood to attention, thinking it was the Greek National Anthem. Then a voice sang out: "IT WAS A TOOTHPASTE COMMERCIAL!" Spain demanded an apology after the wrong Spanish National Anthem was played before a Davis Cup Tennis Match in Australia in 2003. The pre-Civil War Republican National Anthem was played for the Spanish team!